Nokia’s nothing short of a legend when it comes to mobile phones, having been responsible for some of the most iconic handsets of all time. Over the years we’ve seen the brand change hands numerous times, reinventing itself and crossing platform lines in the process, but it’s always been a survivor, managing to find its next niche. Most recently that’s meant creating some no-nonsense, streamlined Android handsets under the direction of HMD Global. Now HMD is finally making inroads onto the US carrier marketplace, bringing Nokia handsets to both Cricket and Verizon. Today we’re taking a look at what that Cricket option has to offer as we review the Nokia 3.1 Plus. As we mentioned when first announcing these carrier deals, the 3.1 Plus for Cricket is a phone that’s very much cut from the same cloth as last year’s international Nokia 3.1 Plus model, but one that gets a splash of new hardware for US shoppers. Will those changes, along with keeping what worked from the original and giving the phone a very attractive $160 sticker price, make the handset an attractive option for America’s pre-paid wireless crowd? Let’s find out. The Nokia 3.1 Plus is a budget phone, and there’s no getting around that. The handset’s made of plastic (on an aluminum frame), the screen’s got significant bezels on all sides … but honestly, none of this bothers me that much. Nokia phones have been using polycarbonate for ages, and while plastic has a reputation as a cheaper material, it feels pretty nice here, with a pleasing matte finish. The back panel peels off with the help of a sturdy thumbnail, revealing microSD and SIM slots — as well as a teasingly non-removable battery. Sadly, this ease of disassembly also means the 3.1 Plus doesn’t offer a lick of water resistance. Advertisement Get 50GB of Premium Bandwidth and 10GB of storage with WP Engine's standard hosting plan! Sign up for a WP Engine plan and receive the Genesis Framework and 35+ StudioPress Themes free! The rounded-corner 5.99-inch display looks like something pulled from a 2017 phone, and that’s not a bad thing. Trickle-down design has brought wide-aspect 18:9 screens to more and more affordable devices, giving this panel plenty of surface area (without any distracting notch). Color temperature’s a bit cool, and brightness feels like it’s on the low side, but especially for what you’re paying it’s hard to find too many complaints. The 1440 x 720 resolution is pushing the lower limit for what’s acceptable at this screen size, but when actually using the phone we didn’t really pay it a second thought. One nice change Nokia’s made since the initial 3.1 Plus debut is upgrading the micro-USB port to a modern Type-C interface, which helps the phone feel less like a lower-end model. Sadly, we can’t say the same about the unit’s speaker, and the rear-mounted grille leaves a lot to be desired — even bottom-edge would be hugely preferable. The phone’s haptics similarly have a just-good-enough feel to them, with “mushy” vibration feedback to user interactions. Though the speaker could have benefited from some more love, at least the move to USB Type-C hasn’t spelled the death of the 3.1 Plus’s 3.5mm jack, and the handset’s ready to start sounding a lot better with the help of your favorite headphones. The rear fingerprint sensor works well and is comfortably located below the phone’s camera package. Nokia gives the 3.1 Plus a dual 13MP/5MP setup for its main shooter, joined by an 8MP selfie cam around front. The unit I tested was a pre-retail model that didn’t come packaged with its normal assortment of accessories — when buying the phone from Cricket it will arrive with a charger and Type-C cable — but it supports common 9V/2A quick chargers for when you do need to top off its battery. Nokia’s original 3.1 Plus is an Android One device, with a clean interface, regular access to updates, and all the goodies that label bestows. For Cricket, the 3.1 Plus drops its Android One affiliation, but we’re still looking at a software package that’s in the same ballpark. That means a very stock-feeling Android 9 Pie, with only a smattering of bloat in the form of some unnecessary apps. Spend a few minutes during setup uninstalling the ones you don’t want, and you’ll soon find yourself in better shape. For its Cricket release, Nokia’s swapped out the 3.1 Plus’s original MediaTek chip for a Snapdragon 439, and while neither would win any benchmark contests, performance is still reasonably spry for a budget device. At least, that’s the case so long as you’re hammering away in one app — the situation takes a turn for the worse when you start multitasking. While the earlier 3.1 Plus offered both 2GB and 3GB RAM options, Cricket’s edition is saddled with just 2GB, and it really shows. You don’t have to switch between many apps to start see them reloading themselves into memory each time you open them. If this were just happening with particularly memory-hungry apps that would be one thing, but to be texting with someone and get booted out of the thread view each time you open the app gets frustrating, fast. At least Nokia hooks users up with 32GB of storage (and not the 16GB tied to the earlier 2GB RAM edition), but it’s a real shame the manufacturer didn’t similarly splurge on memory. One of my favorite things about budget phones is the extent to which mid-range processors just sip away at their batteries, stretching operational life far beyond their more performance-focused brethren. Here, the combination of a good-sized 3,500mAh battery and that Snapdragon 4-series chip give the 3.1 Plus battery life that easily extends into days. When you’re buying a $160 smartphone, odds are you don’t expect a lot from its cameras. And if that’s the outlook you approach the Nokia 3.1 Plus with, you’re not going to be disappointed. The phone’s image-taking prowess is serviceable at best, and so long as you don’t go in with many expectations, its cameras should still get the job done. The main camera is an f/2.0 13MP component, augmented by a 5MP monochrome sensor. The secondary sensor is really only used for false-bokeh shots, and doesn’t add a lot of flexibility to what the Nokia 3.1 Plus is capable of. Probably my biggest issue with image quality is a lack of contrast, especially in outdoor environments — exposure also leans towards being washed out. Auto-focus misses a bit at times, and that can really make macro photography a big struggle. The front-facer is similarly ho-hum. All the cameras here will get you by, but this isn’t even a best-at-this-price-point experience. Maybe. I’ve largely focused on the negatives for this review, but there really is a lot to like about the Nokia 3.1 Plus for Cricket. Since it doesn’t have anything in the way of big flashy features, those positives easily get drowned out, but they’re very much there: the price is great, the software clean and responsive, and while a tad pedestrian I find the handset’s design quite handsome. And really, if HMD had seen fit to give this version of the phone the full 3GB of RAM it got in other markets, I’d probably feel a lot better about recommending it. When I’m thinking about spending under $200 on a phone, there’s one big decision I weigh above all others — do I want a brand-new, budget-focused phone, or should I go for an older used or refurbished model that might have initially been quite a bit higher-end? Over the past year we’ve seen first-gen Pixel refurbs drift down to this level, hitting a lot of the same pure-Android points the 3.1 Plus does while also offering a significantly more satisfying camera experience. And while the Nokia’s battery life is going to run circles around such options, the choice is far from an open-and-shut one. If you take comfort from having a brand-new phone, with a full lifetime of updates ahead of it, the 3.1 Plus warrants consideration. While your options get a lot more interesting when you start shopping around the $300 level, if price is a major limiting factor in your decision, that’s another reason to give the 3.1 Plus a serious look. And especially with this new carrier affiliation, there are users for whom Cricket’s pricing structure and pre-paid nature are going to be very attractive. 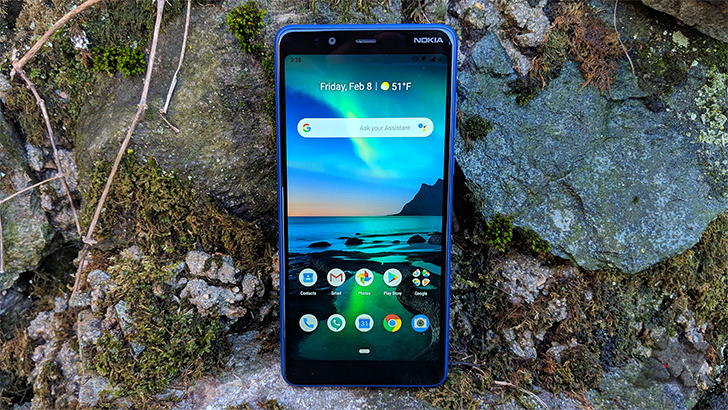 If all that aligns with your interests, and none of the negatives we’ve covered are deal breakers, the Nokia 3.1 Plus is worth picking up. You want a very cheap, straightforward phone with the latest Android software. You just want to walk into a carrier store and be done, without any BYOD work. You don’t mind paying a little more for a mid-range model. I am a tech/news publisher at Techipulse and I love writing anything concerning tech related matters..
MUST HAVE ANDROID APPS – What's On My Galaxy S10 (2019)?! (Download) FIFA 2019 ISO for PPSSPP – PSP Games for Andriod Phones. iOS 12 vs Android Pie – How Different Are They? Android Pie vs Oreo: What’s New! You Can Finally Change Your Online PSN ID, Sony Announces! Get the best tech stories straight into your inbox! © 2017 - 2019 Techipulse Media Inc. All Right Reserved. Get the best tech stories straight into your inbox before everyone else!